A commercial fire supply store named Gateway in Saint Louis, MO will be changing its name to Labenco LLC on January 1, 2018. According to the CEO, this change will reflect the “evolving focus and standards of the company.” While everything about the offered products will stay the same, there will be a change to the company logo and a shift in branding. It should be noted that the old company name is still part of the official title: Gateway Fire Supplies is a division of Labenco LLC. Labenco LLC. is located in the midwest and run by Lou Brummet. They provide businesses with fire safety products in all states except Alaska and Hawaii. Their products are almost entirely American-made. As a member of the National Fire Protection Association, all of their products meet or exceed safety standards. They sell extinguishers that put out the three most common types of fires: A, B, and C. Their most popular item is a Buckeye ABC 5 lb fire extinguisher. Labenco products also work for marine fires. But you will probably see their products hanging in many other factories, buildings, motels, housing complexes, and schools. 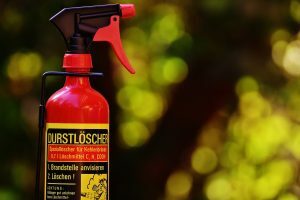 Having a fire extinguisher before an emergency and knowing how to use it is the best way to prevent fires from getting out of control.